ALL-SUITE HANSAR BANGKOK, located in the commercial heart of the city on Rajdamri Road near elegant shopping areas, is offering a special package to mark the three-day Songkran Festival, being celebrated this year from April 13-15. The national holiday is on April 12. The Songkran Package, priced at US 480.22 for two nights based on double occupancy, is available between April 11 – 15, 2013. Hansar’s package includes: Two nights accommodation in Hansar’s Studio Suite; daily complimentary breakfast; complimentary welcome drink on arrival; complimentary free flow Singha beer in the mini-bar; complimentary Songkran Survival kit which includes two water pistols, two Zip-lock bags to keep valuables dry and environmentally friendly sunblock; a complimentary 60-minute Oil Massage and a 30% discount on additional spa treatments; and two special Khao Chae desserts (a delicacy served only during the Songkran Festival). 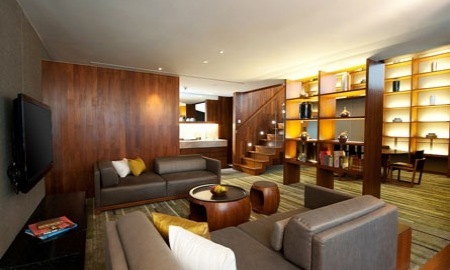 Hansar Bangkok offers the best of both worlds – a boutique experience and extremely spacious accommodations. Hansar Bangkok has 94 suites, offering an integrated workspace, comfort dining and kitchen area flowing into an intimate relaxation and living area.